Bay trees are evergreen trees that originated in the southern Mediterranean region. The bay tree is a slow growing tree that is easily trained as topiary. The leaves of the bay tree are also a common seasoning used in French, Spanish and Italian cooking. If allowed to grow naturally the tree can reach heights between 10 to 15 feet. Bay trees grow well in USDA Zones 8 through 10. Bay trees like to grow in partially shady areas. Watering should be frequent, but water should not be allowed to pool around the roots of the bay tree. If the bay tree is potted it is important to ensure that excess moisture can drain from the pot. Young bay trees need to be protected from strong wind or storms, as young trees are tender and can be damaged easily. This is easily accomplished by keeping young bay trees in pots until they are mature and ready to transplant to the ground. Bay trees produce dark green leaves that are covered with an oil and have a strong scent to them. The leaves of the bay tree leaves are elliptical in shape and are 3 to 4 inches long. In the spring bay trees are covered with small yellow flowers. The female bay trees will produce shiny black berries after the yellow flowers fall off. The berries of the bay tree are not edible, however. Care should be taken when harvesting bay leaves to ensure that they are free of berries. The bay tree is a part of Greek mythology. It is said that the Greek nymph, Daphne, was transformed into bay tree by her father, the river god Peneus. He transformed her into the bay tree so that Daphne could avoid the romantic advances of the Greek god Apollo. However, Apollo never stopped loving Daphne and wore a wreath of bay leaves to show his love for her. 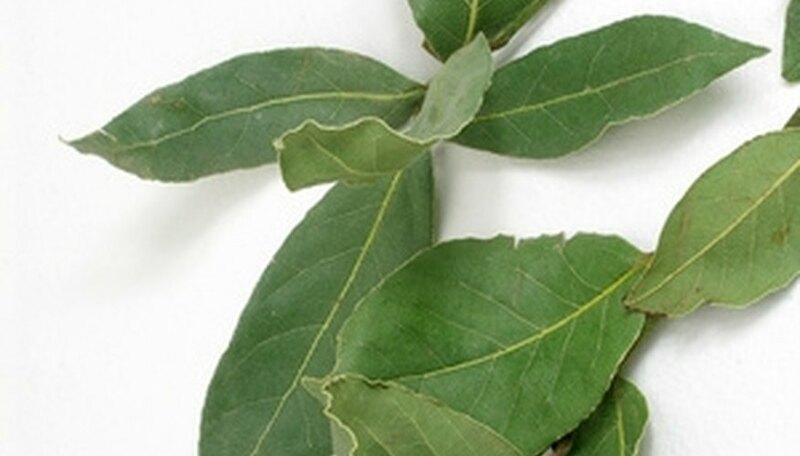 Bay leaves can be purchased fresh, dried or ground. Ground leaves will lose their unique flavor quickly. Dried leaves should still be green when used. If they have turned brown, the leaves have become too old and will be extremely bitter. Bay leaves are used most often in French and Mediterranean dishes and are known for lending flavor to soups, sauces and stews. Always remove a bay leaf from the dish before serving. The leaves of the bay tree are best stored dried. If harvested from a privately owned tree, cut off a small branch with the desired number of leaves attached. Allow the entire branch to dry out. Remove the leaves from the branch and place into a plastic zipper bag to maintain the flavor of the bay leaf.